Stratasys is known for state-of-the-art PolyJet technology with unmatched product realism and more color options than any other 3D printer on today's market. Especially with recent updates to the J750 and J735, their PolyJet printers are some of the most versatile on the market. What makes rapid prototypes, concept models or even jigs and fixtures printed on a PolyJet machine stand out, you ask? The materials. With the right PolyJet photopolymer, designers, engineers and artists can make highly accurate, finely detailed models come to life. Thanks to a wide variety of material options (over 500,000 distinct materials to be exact), the 3D printing possibilities are endless for many industries and applications. 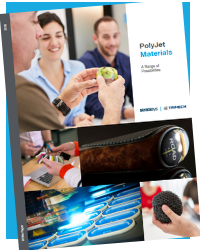 Download our white paper to find out which PolyJet material properties and best practices will set your company up for success. Fill out the form to download instantly!